From New Chum on a previous post: Big List of 170 Trump accomplishments in 340 days with the sub-head: “Most comprehensive compilation of 1st-year achievements”. There are 170 but will list only the first and last. You can read the rest yourself to become the most popular person at your New Year’s party tonight. 170. EPA reform: More than 700 people have left the Environmental Protection Agency since Trump took office, nearly a quarter of the way toward its goal of shrinking the agency to Reagan-administration levels. . . .
And while we’re at it, my best wishes to you all for the coming year. Early Stages Of Regime Change? That’s from Drudge. This is from Instapundit. CNN’S IRAN CORRESPONDENT: World Thinks That America Doesn’t Have A ‘Moral Leg To Stand On’ [VIDEO]. 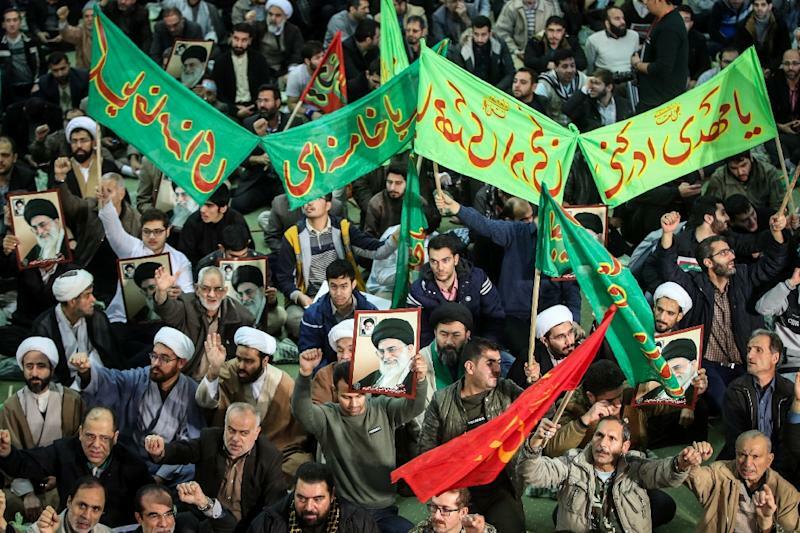 How will the Obama Presidential Library wing look celebrating a nuclear deal with an oppressive Iranian regime that could possibly be deposed by security forces and the military joining with protesters, thirsty for democracy and a return to an Iran before the 1979 revolution? 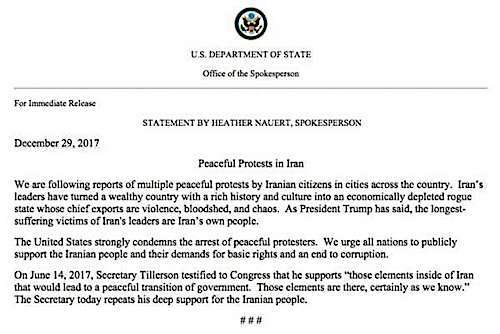 More to the point, how will it look if the Trump administration, of all things, facilitates and encourages such change in Iran? The prospect of this is not lost on the self-styled resistance and anti-Trump media, all too anxious to witness the ribbon-cutting ceremony at the Obama Library or hand a Nobel Prize to former Secretary of State John Kerry. Overseeing the fall of an oppressive, hardline Iranian regime that sponsors terror all around the globe – followed by the rise of a democratic Iran not interested in aggression against its neighbors – would be a foreign policy victory for President Trump, one of the biggest for a president since the fall of the Berlin Wall. Take a bow, Valerie Jarrett and Ben Rhodes: In order to buy an extra 15 minutes for the charade of Obama’s Iran deal, you’ve reduced the DNC-MSM to shilling for the Iranian mullahs. I’ve heard vague reports they’re not entirely woke when it comes to LGBT issues and intersectional feminism, but I’m sure that’s all just rumors and hearsay. Why have I never seen this photo before? From Steve Hayward’s The Year in Pictures. Now updated with the above video from 1977. I fear we are looking at a breath of sanity in the midst of madness, but enjoy it while you can. President Trump mocked the idea of global warming in a tweet Thursday, making one of his first (if not the first) such public comments on the topic since entering the White House almost a year ago. Why it matters: Trump has tweeted in the past that he thinks global warming is a hoax, but that was in 2012 and he has not focused on the topic much at all in his Twitter activity as president. This tweet shows he’s still openly mocking mainstream climate change science, even without directly questioning it. Fast facts: Most scientists agree human activity, primarily through the burning of fossil fuels, has been the primary contributor to Earth’s aggregate temperature going up this past century. That does not mean, though, that freezing cold weather, like the East Coast is experiencing right now, won’t happen in the future in many parts of the world. Climate change science is much more complicated than that, but citing cold weather is still a favorite line of politicians and others who doubt climate change is happening. Sen. James Inhofe, Republican from Oklahoma, threw a snowball on the Senate floor in February 2015 to mock global warming. One level deeper: Trump’s tweet was also mocking the Paris climate deal, a global accord virtually every country in the world except the United States supports. It calls on countries to cut greenhouse gas emissions, but as it stands the commitments wouldn’t cut emissions to the levels most scientists say is needed. America’s commitment under President Obama was actually relatively moderate — up to 28% cut in such emissions by 2025 based on 2005 levels, but the Trump administration pointed to conservative groups’ studies showing it could cripple the U.S. industrial economy while other countries, notably China, were called on to do less. Between the lines: The Trump administration released without political influence a statutorily required reportearlier this year confirming in great depth that human activity is driving climate change. Trump’s tweets get a lot of attention, but make sure to also watch what the administration does or doesn’t do on this issue. The bottom line: Words matter, and so do the president’s tweets. His perspective on this issue is influencing his most ardent followers, a new poll suggests. A survey released in October from George Mason University found that just 21% of conservative Republicans think global warming is mostly human-caused, a decrease of nine points since earlier this year. One more thing: The semantics around climate change, or global warming, are almost as divisive as the science itself. Global warming was the default term up until the last decade or so, when climate change became more popular among those urging action to cut greenhouse gas emissions. That shift was partly to respond to comments like Trump made Thursday by clarifying that a higher global aggregate temperature does not mean the entire planet would be getting universally warmer. And for interest, you can follow the entire twitter conversation here. It’s an astonishing thread. A very classical distinction that is lost on most economists today. There is this grand distinction between an individual borrower and a borrowing government, that, in general, the former borrows capital for the purpose of beneficial employment, the latter for the purpose of barren consumption and expenditure. From his Treatise on Political Economy dealing with “Of the Consumption of Wealth”. From Steve Hayward at Powerline. There is something ironic about the fact that a grand White House Magnolia tree planted during Andrew Jackson’s administration is going to come down during the administration of the most Jacksonian president since Old Hickory. (By the way, if Jackson was “Old Hickory,” maybe we should call Trump “Old Spice”? It fits in some ways, if you think about it. . .) Rim-shot! What—is Melania herself going to wield the ax? Please put that on pay-per-view. 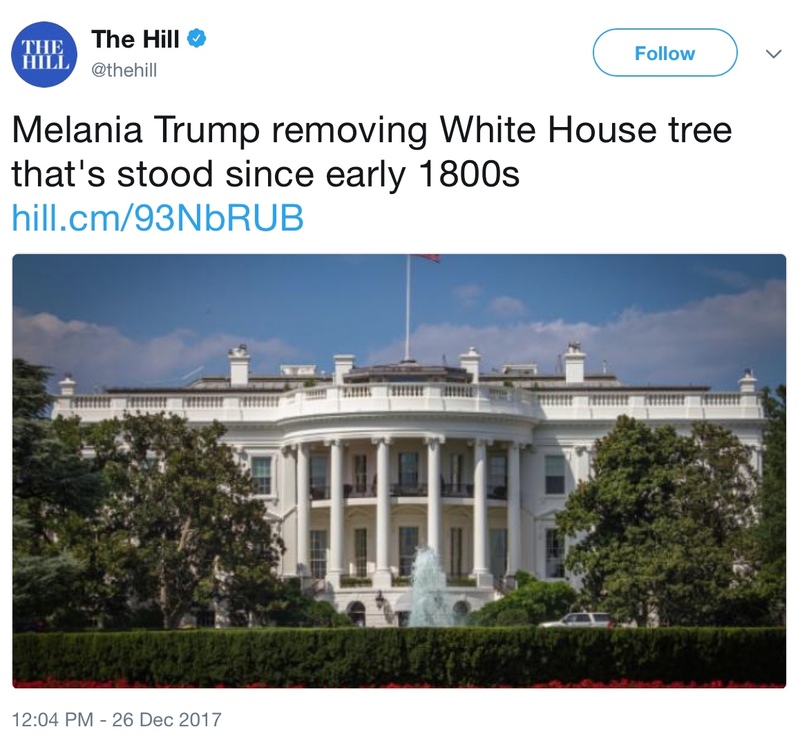 You have to read way down in the (often corrected or amended) stories to learn that this has been on the minds of White House arborists for some time, such that they have been cultivating cuttings from the tree—some of them already 10 feet tall—that will replace the old one. 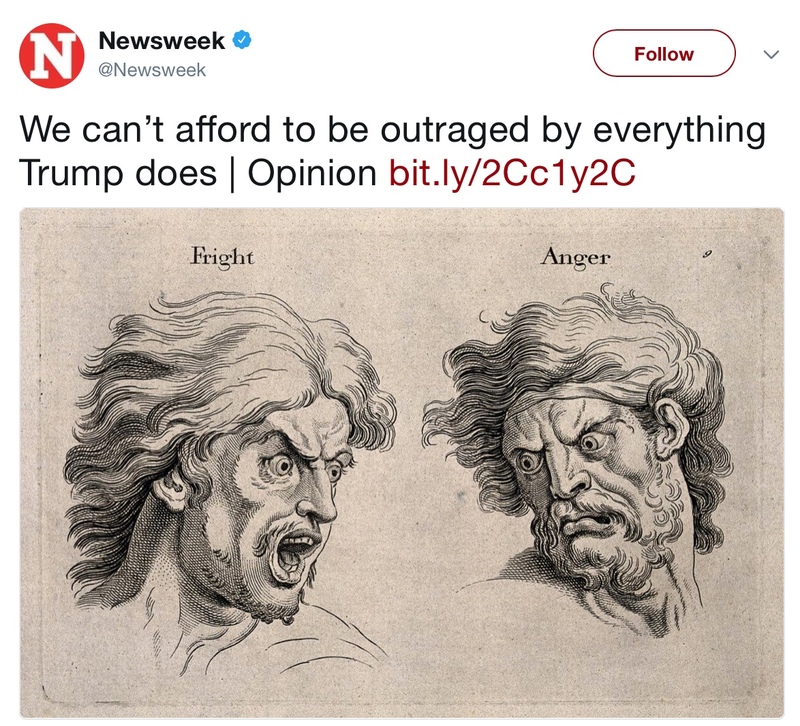 And people wonder why Trump repairs to “fake news” so often. Yeah, after all it’s not like Melania or Donald Trump are William Gladstone or something.